In a rare and incredible order on 16th September 2016, the Delhi High Court dismissed the copyright infringement case filed in August 2012 by Oxford University Press, Cambridge University Press and Taylor and Francis Group against Rameshwari Photocopy Shop in Delhi School of Economics and Delhi University. Justice R.S. Endlaw in a 94 page long judgment interpreted the educational exception under section 52(1)(i) of the Copyright Act, 1957 as covering the act of photocopying prescribed reading material for university courses. The publishers sought to claim damages to the tune of 60 lakh rupees from the shop citing infringement of copyright, which the publishers claimed was happening through photocopying of parts of books published by them. However, the publishers themselves stated that this suit, for them, was a test case where they wanted to introduce licensing systems across universities in India. These licensing systems intended to control the extent to which material could be photocopied and also direct a share of profit from these reproductions to the publishers. We, the Association of Students for Equitable Access to Knowledge (ASEAK) demanded to be made a defendant in this case as we believed that it is the right of students to access reading material that was at stake in this case- “Association of Students for Equitable Access to Knowledge (ASEAK) filed IA No.3454/2013 for impleadment in the present suit and which was allowed vide order dated 1st March, 2013 and ASEAK impleaded as defendant No.3.” (from the judgment). We at ASEAK, had maintained from the beginning that the exceptions within the Indian Copyright Act, 1957, keep reproduction of material for the purposes of education outside the purview of what constitutes copyright infringement. 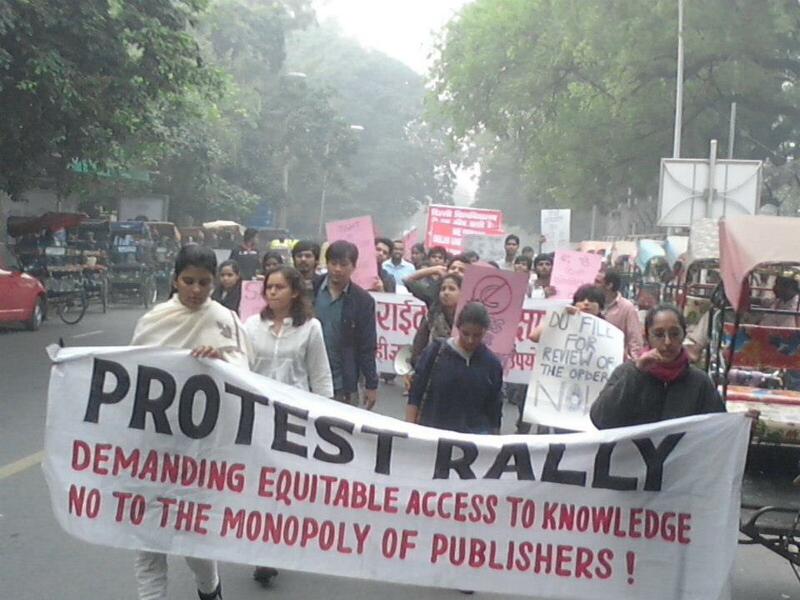 Sure, publishers are running profit making enterprises but universities are not a market. Students pursuing higher education in India come from starkly different socio-economic backgrounds and further, most public universities work with a severe resource crunch. This is worsened by the prohibitively high costs and very limited reach of academic books, which the publishers anyway do not seem to be producing for students. They only make it to libraries and shelves of highly paid academicians. Photocopying, then, is just a quick fix in a system which is unable to meet simple demands of students studying in universities. In this situation, to put restrictions and further try to control and profit from a system which in itself is ramshackle and can hardly be afforded by a majority of students is pure evil. We so far had only appealed to the court to remove a stay order which had been put on Rameshwari Photocopy shop against photocopying from books of the said publishers. The court has gone far ahead and dismissed the publishers’ case. Justice Rajiv Sahai Endlaw observed in the judgment that, “copyright, specially in literary works, is not an inevitable, divine, or natural right that confers on authors the absolute ownership of their creations. It is designed rather to stimulate activity and progress in the arts for the intellectual enrichment of the public. Copyright is intended to increase and not to impede the harvest of knowledge. It is intended to motivate the creative activity of authors and inventors in order to benefit the public”. The judgment has also observed that there is no evidence of “actionable infringement” when it comes to photocopying by the university and its agents, and therefore there is no need for trial and the “suit is accordingly dismissed”. As observed earlier, publishers and universities (with their limited resources) together create a situation where students have to rely on photocopying. Academic books are highly expensive and university libraries only keep a few copies. Justice Endlaw observed in the judgment – “If the facility of photocopying were to be not available, they would instead of sitting in the comforts of their respective homes and reading from the photocopies would be spending long hours in the library and making notes thereof. When modern technology is available for comfort, it would be unfair to say that the students should not avail thereof and continue to study as in ancient era. No law can be interpreted so as to result in any regression of the evolvement of the human being for the better”. Fact: The Indian Copyright Act 1957 provides an exception to infringement of copyrights in the context of educational use. Section 52 deals with those acts that will not be counted as infringement of copyright, and amongst others, Article (h) of the section states: “(h) the reproduction of a literary, dramatic, musical or artistic work- (i) by a teacher or a pupil in the course of instruction; or (ii) as part of the questions to be answered in an examination; or (iii) in answers to such questions” does not amount to an infringement of copyright. The law was thus framed in such a way as to recognize the primacy and importance of first ensuring access to education in a developing country like India, and only then attending to concerns of copyrights. Moreover, the notion of copyrights was introduced to further intellectual and creative activity and therefore to protect the interest of authors, not to serve the interest of publishers. Fact: No academic author would dream of growing rich on money gained from their book’s sales. They get paid pittance from the publishers in the name of royalties. Instead, most academic authors are employed by universities that provide the resources and environment for the production of academic texts, in addition to providing remuneration in the form of salaries for the intellectual labour they put in. Moreover, several well known authors have voiced their discontent against the publishers including Amartya Sen, Nivedita Menon and several others who even signed photocopies of their books and presented them to libraries in Delhi University thereby expressing the view that they consider photocopies of their work as valid educational material. This is a clear testimony that authors, especially academic authors, write to be read and not because they earn their living from royalties of their books. The dissemination of her ideas is the author’s prime concern. Finally, universities that employ academics are funded by the state and through students’ fees. So the remuneration for the intellectual labour that goes into producing books that are part of our courses comes from public funds. Myth 3: If students were to buy the syllabus prescribed books from the publishers it would cost them “a couple of extra coffees per month”! Fact: The cost of books prescribed per semester in most courses runs into several thousands. Therefore, the assumption that spending the extra bucks to purchase the books referred to in syllabi will amount to nothing more than “a couple of extra coffees or a Dominos pizza” is patently incorrect if not arrogant. More importantly, however, such views assume that all students come from an affluent background and are only being stingy in not paying up for the publishers products. This is a most ignorant remark that tries to simply erase the experience of the many who struggle against severe odds just to make it to the institutions of higher education in our country. Moreover, it is uncomfortably at peace with the idea that higher education may only be restricted to the rich. The proposal that universities should buy photocopying rights from publishers where they get a per page royalty simply disregards our law that already has exceptions for photocopying for educational purposes, an exception that prioritizes education over copyright. Today is a moment where the struggle and conviction of students has asserted itself in a powerful way. We want to remind the publishers that their market ends at the gates of the university. The knowledge produced in public universities belongs to the public. When the world is moving towards open access to knowledge, trying to restrict it for commercial gain is outrightly regressive. It is in these universities where minds like Rohith Vemula read about Carl Sagan. And it is minds like his that continue to keep these spaces and possibilities in it alive! Wonderful post. This is a nice post and gives in-depth information about Job Openings in Education . Great tips!